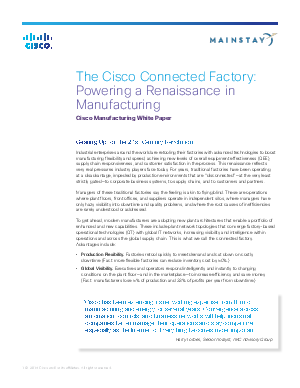 The Cisco Connected Factory provides a clear set of architectural guidelines and products that tie together factory automation systems, enterprise applications, and the wider ecosystem of supplier and partner solutions. This will help you make more strategic business decisions backed by real-time data from the plant floor. Download this white paper to learn how you can decrease downtime, introduce new products faster, and foster innovation.